I love the idea of a Sunday brunch wedding. There are so many fun ideas that work only for a Sunday brunch wedding, like this week's Pin of the Week. How fun is that waffle bar? It's so easy to set up too. Roll out kraft paper across a table. Have waffles on white plates and set them up on one end. Add your favorite condiments (syrup, Nutella, peanut butter, etc.) on your first station. Set up toppings (berries, nuts, sprinkles, etc.) in white bowls as your second station. End with whipped cream and chocolate syrup. Use a Sharpie to write on the kraft paper with each "step" or "station" and your waffle bar is done. This would be such a cute action station (which you know I'm a huge fan of) for your brunch cocktail hour -- or even great for your breakfast the day after your wedding. 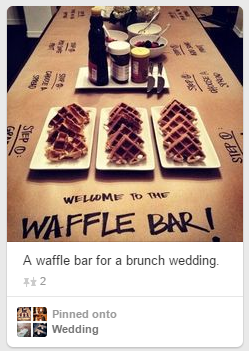 BRIDAL BABBLE: What would you put on your waffle?